PHILADELPHIA, PA – October 17, 2016 – Janney Montgomery Scott (“Janney”), a leading full-service wealth management, financial services and investment banking firm, announced the recent hiring of three new fixed income professionals. Clay Brasher, Joseph Schults, and Luke Weeks, have all joined the firm. 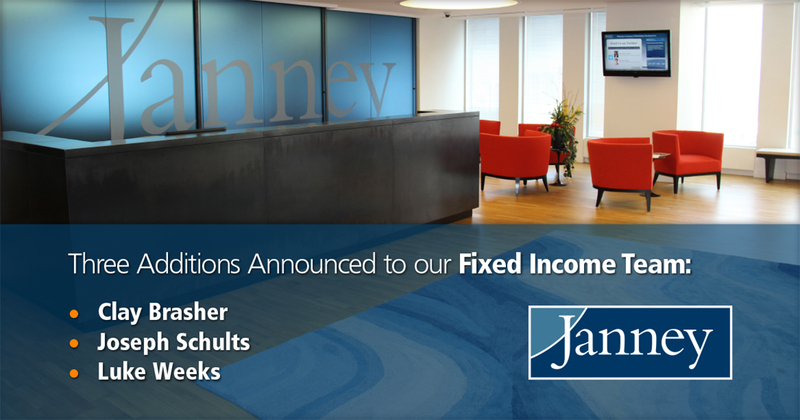 Clay Brasher has joined the Janney’s fixed income trading team. Clay will be working in the institutional mortgage/structured credit trading group in New York City. Clay joins us from GK Baum & Co. where he was involved in the CLO/CDO market. Clay has a B.S. in Business Administration from Birmingham Southern College and his MBA from the University of Alabama. He and his wife Kristen have moved from Birmingham Alabama to New York City. Please reach out to Clay and welcome him. “We’re excited to have him. He’s a great guy with wealth of knowledge and will be extremely additive as we continue to build our trading group,” said Tom Bajus, Head of Fixed Income Trading. Joseph Schults joins us from StormHarbour Securities as a Vice President in our Securitized sales group, he will be located in our New York office.Prior to StormHarbour he did Small Cap Equity Research at Sidoti &Co. and started his career at Ramirez & Co. Joe earned his undergraduate degree in Business Administration from the University of Massachusetts. Luke Weeks joins us from Citi as a Director in our FIG group and he will be located in our New York office. In his 14 years at Citi he held a number of positions; Dealer sales, Prop Trader-Global Special Situations Group, Frankfurt Germany and Rates sales. Luke earned his undergraduate degree in Economics from Colgate and his MBA from the NYU Stern School. He is fluent in German and conversant in Swedish. “We are very pleased to have Joseph and Luke join our team as these well-respected fixed income sales professionals will help us capture market share and grow our service offerings. We continue to expand our institutional fixed income business and focus our efforts on building a strong platform that attracts talent and delivers value to our clients,” stated Michael McNamara, Head of Fixed Income Sales.